Royal Challengers Bangalore will take a battle with Mumabi Indians on Friday Arill 14th in Chinnaswamy Stadium at home Bangalore. 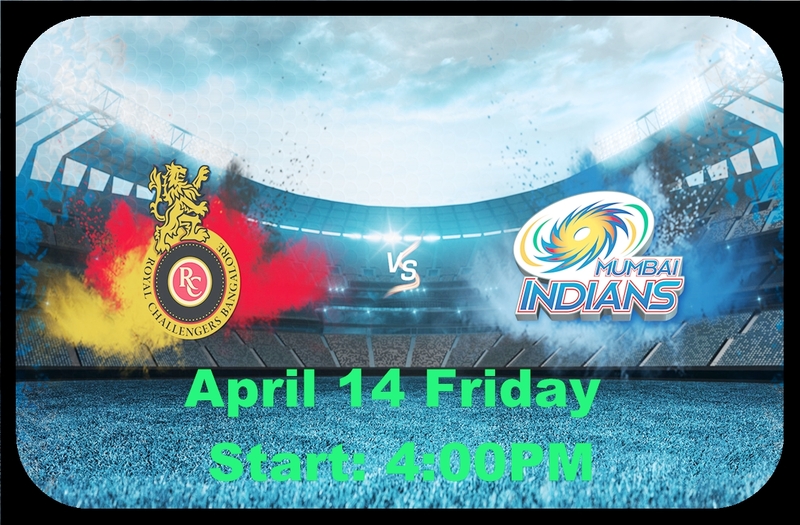 Having lost two of their three matches in this IPL season 2017, Royal challengers Bangalore received a massive boost ahead of their game against Mumbai Indians on Friday April 14th, with regular captain Virat Kohli likly to make his comeback after a shoulder injury lay -off. Kohli, who sidelined for at least the first week of this season IPL due to shoulder injury in last Test series against Australia. He is all set to return to field when Royal Challengers Bangalore host the Rohit Sharma led side at the Chinnaswamy Stadium in the day of Friday double Header. It is early day of IPL season to say, But Royal Challengers Bangalore find themselves in the wrong half of the ponts table having lost two in their three encounters so far, by sizeable margin. As early season clashes go, Friday's clash is against in form Mumbai Indians is big as it gets for Kohli and co. Another defeat and the last season finalist could see themselves branded as early season laggard. To turned things around, Royal Challengers needed to score runs from top order batsman, which was not happened in the previews games. Bangalore played 57 dot balls against Kings XI Punjab. But not only problem with bat RCB have problem. After a good day on the field against Daredevils, RCB turned another fumbling , disciplined performance in Indore. Kohli return may be boosted Royal Challengers Bangalore, but he scores 11 fifties in 16 games in the season and MI is the only team against whom failed to go past fifty even once. AB de Villiers have played a exploding innings against KXIP, RCB will hope he will do in this game also. Mumbai Indians won last two games of three, but the problem was not solved for MI. In the last game also top order batsman failed to good score like Nitish Rana, Hardik Pandya, and Krunal Pandya has been doing in the middle order. Young players are coming to rescue Mumbai Indians. Captain Rohit Sharma bad form continued in the last game also, to win this game big players of MI should play well knock here to give challenge to host Bangalore. In the previous game Mumbai Indian's bowler gave winning contribution for the team. To keep Royal Challengers Bangalore quite Mumbai Indian bowling side should give their best of best, because Bangalore team have batting star players of Chris Gayle, AB de Villiers and Virat Kohli. One disadvantage for the both side bowlers is that the Chinnaswamy Stadium's has small boundary, so runs flow here for the batsman. - stadium the most by any team against opponent home venue in IPL. * RCB score at 6.50 runs per over in the power play - the lowest all among the teams so far this - IPL. * The only team to score at less than seven runs per over in the power play.